Neurophenomenology combines phenomenology and neuroscience to study experience. The term neurophenomenology, first used by Laughlin, McManus, and d’Aquili (1990), was distinguished as a new research direction for the neuroscience of consciousness by Francisco Varela (1996) and colleagues in the mid-1990s. The field of neurophenomenology has expanded exponentially around the central question of how consciousness and subjective experience relate to the brain and body or the embodied mind (Gallagher, 2005; Thompson, 2007; Varela, Thompson, & Rosch, 1991; Zahavi, 2008). While the “easy problems” for neuroscience pertain to questions about the difference between wakefulness, sleep and the mechanisms that allow us to focus our attention, the “hard problem” is the relationship between objective knowledge and subjective experience or qualia. Drawing on Rogers’ (1964) “three ways of knowing:” subjective, objective, and interpersonal, neurophenomenologists combine first-person accounts of phenomenological lived experience with third-person, neurophysiological data as co-emergent enactive processes in research (Lutz & Thompson, 2003; Petitot, Varela, Pachoud, Roy, 1999; Thompson, 2001). For example, Varela pursued experimental studies using multiple electronic recordings, mathematical analysis of large-scale neuronal integration during cognitive processes, and philosophical and empirical studies of human consciousness. Neurophenomenological research also accounts for the second-person perspective: the interpersonal, intersubjective dimensions of conscious experience in which the person enacts experience in interdependency with surroundings from which meaning becomes inseparable. Varela believed that scientific research needs to be complemented by detailed phenomenological investigations of human experience as it is lived and verbally articulated in the first person. Also, that the study of consciousness had the potential for inciting a major revolution in what science is about and how it is practiced, by going beyond subject-object dualism, to the embodied enactive self. Embodiment is the bodily aspect of human subjectivity—the biological and physical presence of our body as the precondition for the experience of emotion, language, thought, and social interaction—and our kinesthetic awareness of the body as the vehicle through which we experience the sensorimotor, perceptual, and non-conceptual lived world that is tacit, prereflective, and intersubjective. Enactive refers to the self that brings forth its own cognitive domains. The nervous system does not process information, it creates meaning. Thus, cognition, as embodied action, is a relational domain enacted by a being’s autonomous agency and autopoietic mode of coupling with their environment. Varela explored ontogenic developmental learning, perception-action in the synchronous coupling of neuronal cell assemblies, and present-time consciousness philosophically rooted in the functionalism of William James and the European Continental traditions of Edmund Husserl, Martin Heidegger, Maurice Merleau-Ponty, and Jean Paul Sartre in existential phenomenology. 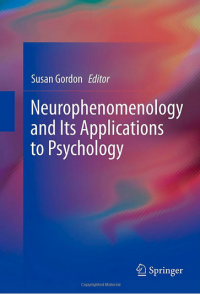 Neurophenomenology introduces an approach to philosophy, psychology, and human science that is able to articulate the ontological ground upon which science itself operates in ways that are not accessible to positivist science (Robbins & Gordon, in press). Phenomenology studies consciousness, both the rational waking state as well as dynamics of the unconscious, as it is experienced from the first-person point of view. Experience must be grasped holistically as a relationship in which the subject relates to an object through its meaning. Cognitive behaviorism, the standard in mainstream theoretical and clinical psychology, founded on reductionistic positivism, can neither address the implications of the neuroscience revolution regarding the phenomenology of consciousness nor the relationship between the mind and the brain because it lacks a self-reflective element. Science ignores human consciousness in operationally defining the person when it disregards phenomenological data that it cannot see or measure. Science needs grounding in self-reflection, contemplation, and an embodied approach to experience that is unrestricted to the study of behavior and a person-centered, phenomenologically-oriented psychology that is foundational to the sciences (Gordon, 2013; Taylor, 2009, 2010). Neurophenomenology provides a theoretical and practical framework that integrates the natural and human sciences to consciousness inviting an interdisciplinary dialogue on the nature of awareness, the ontological primacy of experience, the perception of the observer, and the mind-brain relationship that is shaping the future of psychological theory, research, and practice. Integrating Western Anglo-American and Continental phenomenology, with cognitive science, and Eastern contemplative experience and practices, neurophenomenology is an interdisciplinary bridge to a person-centered science that neither reduces the mind to the physiology of the brain, nor the living organism to cause and effect relationships. The book Neurophenomenology and Its Applications to Psychology grew out of a symposium that I chaired at the annual convention of the APA in Toronto, Canada (2009) titled, “Neurophenomenology and the Enactive Approach to Cognition.” It includes a contribution from Brent Dean Robbins entitled, “Enactive Cognition and the Neurophenomenology of Emotion,” in which he argues that an account of emotion needs to preserve the meaning of experience as it appears in the life-world of the person, rather than being based on inferences drawn from laboratory conditions. We need to step back to examine how form is constituted as an object for cognition. In “Neurophenomenological Praxis: Its Applications to Learning and Pedagogy,” Robert G. McInerney introduces neurophenomenology to the psychologist-educator, and a prereflective, situated, enactive assessment of learning and thinking. Olga Louchakova-Schwartz presents original research of visuospatial processing in Tibetan monks using phenomenological–cognitive mapping of awareness during meditation in her contribution entitled “Mutual Enlightenment: Cognitive Phenomenology in the Study of Tibetan Meditation.” The late Eugene Taylor presents a chapter on “Déjà-Vu: William James on ‘The Brain and the Mind,’ 1878,” in which he explores the historical and theoretical basis of James’ philosophy of radical empiricism for present day neuroscience, and its implications for the ‘hard problem’ of consciousness with regard to the intersubjective presence of the experimenter on the outcome of what he or she studies. And finally, I introduce an autopoietic model of the mind-brain continuum: the confluence of psychological, neurological, and intracrinological processes modulated by the person’s perception of experience and sense of well-being in the development of meaning and emergence of self in a section entitled “Psycho-neuro-intracrinology: The Embodied Self.” Dedicated to Francisco Varela and to Eugene Taylor, this book begins with an In Memoriam for Taylor as this book contains his last published work while the Introduction is a tribute to Francisco Varela. Stanley Krippner, discussant for the original symposium, wrote the Foreword for this book that introduces steps towards a more experiential, non-reductive, holistic, phenomenologically oriented, descriptive psychology of immediate experience, and a person-centered science. Gallagher, S. (2005). How the body shapes the mind. London, UK; New York, NY: Oxford University Press. Gordon, S. (Ed.). (2013). Neurophenomenology and its applications to psychology. New York, NY: Springer. Laughlin, C., McManus, J., & d’Aquili, E. (1990). Brain, symbol and experience: Toward a neurophenomenology of consciousness. New York, NY: Columbia University Press. Lutz, A., & Thompson, E. (2003). Neurophenomenology: Integrating subjective experience and brain dynamics in the neuroscience of consciousness. Journal of Consciousness Studies, 10(9–10), 31–52. Petitot, J., Varela, F. J., Pachoud, B., & Roy, J.-M. (Eds.). (1999). Naturalizing phenomenology: Issues in contemporary phenomenology and cognitive science. Stanford, CA: Stanford University Press. Rogers, C. (1964). Toward a science of the person. In T. W. Wann (Ed. ), Behaviorism and phenomenology: Contrasting bases for modern psychology (pp. 109–140). Chicago, IL: University of Chicago Press. Taylor, E. I. (2009). The mystery of personality: A history of psychodynamic theories. New York, NY: Springer. Taylor, E. I. (2010). William James and the humanistic implications of the neuroscience revolution: An outrageous hypothesis. Journal of Humanistic Psychology, 50(4), 410–429. Thompson, E. (Ed.). (2001). Between ourselves: Second-person issues in the study of consciousness. Charlottesville, VA: Imprint Academic. Varela, F. J. (1996). Neurophenomenology: A methodological remedy for the hard problem. Journal of Consciousness Studies, 3(4), 330–349. Varela, F. J., Thompson, E., & Rosch, E. (1991). The embodied mind: Cognitive science and human experience. Cambridge, MA: The MIT Press. Zahavi, D. (2008). Subjectivity and selfhood. Cambridge, MA: The MIT Press. Today’s guest contributor, Susan Gordon, PhD, is Core Adjunct Professor of Psychology at National University, La Jolla, CA, and Research Director of the Southbury Clinic for Traditional Medicines, Southbury, CT. She earned an MA in Health Psychology (2001) and a PhD in the History and Philosophy of Psychology (mind/body medicine) from Saybrook University.